A Day in the Life of a Super Mom: A Mommy Blog: Does Stuff Like This Only Happen to Me? For the past few nights I have heard something in the kitchen. It's always been late at night and it's always been quite freaky. Everyone I tell to, "Shut up and listen, there's something in the kitchen! ", look at me like I'm nuts cause they never hear it. Well, after picking up my parent's car to replace my broke down piece of scrap iron, I finally got the kids and myself home around 12AM. My youngest daughter went into the house before anyone as I was trying to collect my bundle of sleep, Adrian. As soon as I was approaching the porch, a blood-curdling scream tore through the house and into the yard. Hannah, Evie and Savannah came tearing out of the house! 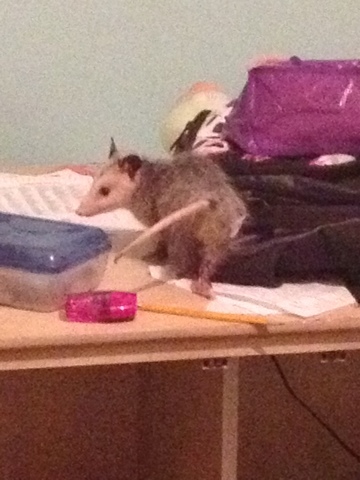 "There's a 'possum minding his own business in the hall! ", Hannah cried. I was mortified! "Was it a big one?" I asked. She shook her head. "No it was a teenager!" Needless to say, the kids and I stood outside for awhile before I gathered the gumption to go inside and hunt down the critter. Hannah said he had ran into one of the bedrooms, so I quickly closed all the bedroom doors and made the kids all sit on the sofa. I didn't know what to do. So I called the fuzz. That's right, I did. I didn't call 911 because it just didn't seem like one of those times. The cop proceeded to inform me that they didn't handle feral animal cases and unless I could pay (which I really don't have the extra cash) a private animal control agency, my kids and I just acquired us a new pet. So after getting shot down like that, I made my way into the kitchen for a drink and guess who was sitting in there waiting for me? You guessed it! 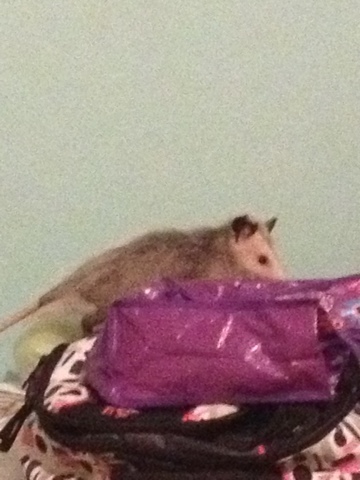 That crazy teenaged possum. I kept my cool as he scurried off into the laundry room and behind my washer. I made the kids go to bed in my room and close the door. So here I am waiting to hash it out with the little marsupial. I can hear him playing in the kitchen. But the little bugger better live it up while he can, cause his booty's about to get it!